When we visited Italy in 2006, Sherie and I had planned the trip around a swap of her time share (crime share) for a week in a hotel in Cortina de Ampezzo, Italy. Cortina was the site of an early winter Olympic games, from which it gained international notice. As it is situated in the Dolomites, a major mountain region in Italy, Ben had always been interested in visiting there. After all, his climbing hero Reinhold Messner calls the Dolomites home. During WWI, the Austrians and Italians had fortified much of the region with tunnels and fortresses, using wire cables and metal ladders to make the climbing easier for the troops. This legacy lives on in the via ferrata (iron way) as a means of travel on the ridges that is more than hiking but less than free climbing. The ski lifts have made it easy to get around in contemporary times all year round; the “huts” up high have made the dining and drinking live up to the regional Italian standards. Weather you ski or hike, using the huts makes for convenience and safety well above the villages. 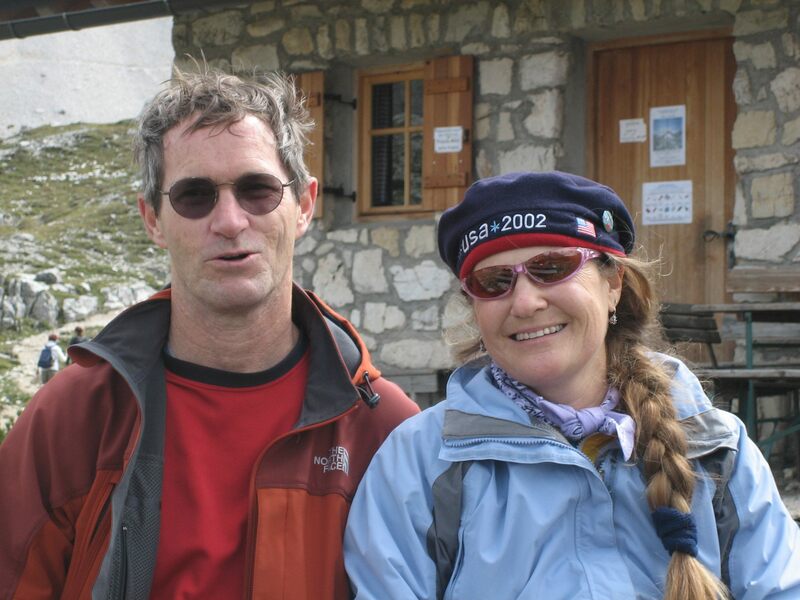 Enjoying a hike, refreshment, and each other in the Dolomites, 2006. Sherie and I rode lifts and hiked in several places in 2006, but only did very short explorations at the beginnings of the via ferrata. We also rented mountain bikes for one day, and explored the roads in the valleys down below. We saw some road cyclists, and dreamed of someday returning to ride in Italy. As we had decided to not rent a car, and to visit Venice as well on that trip, we kept our luggage light so we could more easily take trains and buses on our travels between towns. We ended up visiting Venice, Cortina, Bolzano, Verona, and again in Venice in August and September of 2006. Watching the Giro d’Italia on TV in the Dolomites only fueled the urge. And as we have gained strength on our bikes over the last couple years, we came to realize that not only could we ride in Italy, but we could also ride in the Dolomites. We could experience the bike culture from the Italian roads if we dared. It seems that each year about one in three people who enter the lottery get into the Maratona, although I am not sure if the odds get stacked differently if you are from the USA. While Sherie and I had schemed of using a tour company to arrange our riding trip, we decided that if we got on our own it would be more affordable and let us extend the trip longer. So in the fall, Ben decided to enter the lottery for the Maratona. As we age, we won’t always be able to be strong enough to do the entire ride (~85 miles, 14k vert feet.) So Ben felt we should enter as a team (we either both get in, or neither get in) each year starting now so we could have a few tries. And sure enough, in November 2010, we saw our name on the website lists as in as “Grizzly Peak Cyclist team” and received our email instructions.